The sale service provides endpoints to purchase (virtual) items or physical cards for the user or for another person (i.e., a gift). A successful call to GET sale/saleConfig.json will return a “Program” object which contains the shipping/payment methods available to the user and the customization options for the specified eGift program. User will select an image/amount for the eGift and provide information about the gift recipient. The call to POST sale/calculatePrice.json includes the items ordered and the shipping method. The server applies per-item and per-order discounts and returns a summary of the sale order in a successful response. 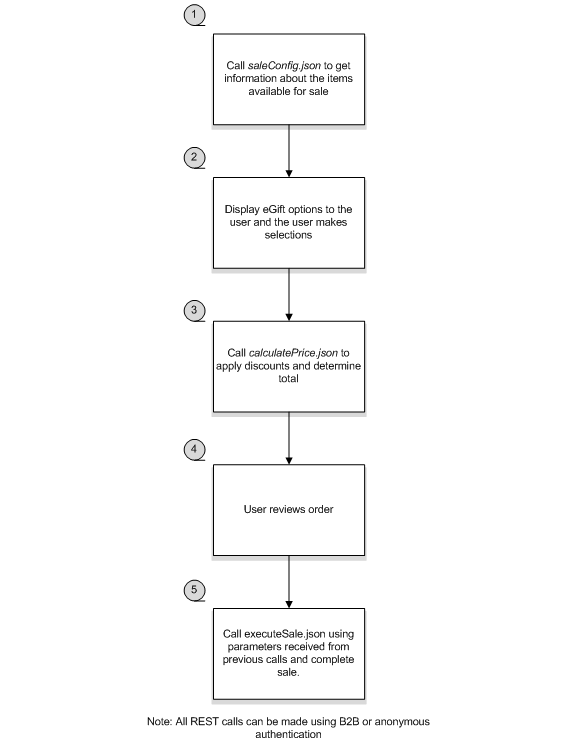 Perform a call to POST sale/executeSale.json with shipping, billing, and sale information. The successful response returns a summary of the completed sale. Returns information for the configuration and display of an “order” page. Codes and values in the response to this endpoint will be used when calling the POST sale/executeSale.json endpoint. This endpoint is typically used for non-logged-in users since some sale programs can be performed without having an account. See GET sale/saleConfigForAccount.json for logged-in users. programType (String) – (required) Paytronix-assigned code. See webSaleProgramType Values for values. cardTemplateCode (Integer) – (required) Paytronix-assigned card template code identifying the card type of the user. tierCode (Integer) – (required) Paytronix-assigned tier code identifying the tier grouping of the user. program (Object) – (required) See Program for format of the object. Returns information for the configuration and display of an “order” page. Codes and values in the response to this endpoint will be used when calling the POST sale/executeSaleForAccount.json endpoint. This endpoint is used for logged-in users. See GET sale/saleConfig.json for non-logged-in users. Returns information for the configuration and display of an “order” page. Codes and values in the response to this endpoint will be used when calling the POST sale/executeSale.json endpoint. This end point is specific for loyalty card sales. program (Object) – (required) See LoyaltyCardSaleProgramConfig for format of the object. Executes the sale for the specified program and input fields. This endpoint is typically used for non-logged-in users since some sale programs can be performed without having an account. See POST sale/executeSaleForAccount.json for logged-in users. billingContact (Object) – (required) See Contact for format of the object. billingAddress (Object) – (required) See Address for format of the object. shippingSameAsBilling (Boolean) – (required) If true, then the shippingContact and shippingAddress are optional and will be defaulted from billingContact and billingAddress. shippingContact (Object) – (required) See Contact for format of the object. shippingAddress (Object) – (required) See Address for format of the object. paymentMethod (Object) – (required) See PaymentMethod for format of the object. shippingOptionCode (String) – (optional) One of the shipping option codes returned by the GET sale/saleConfig.json call if required by the chosen program. totalPrice (Decimal) – (required) This is the value returned by a previous POST sale/calculatePrice.json call. It is used to confirm that none of the prices and discounts have changed since the user started the sale workflow. hasGiftBox (Boolean) – (optional) If true and relevant to the program, then the items will be in a gift box. activationStoreCode (String) – (optional) If required by the program, then this will be the store to which newly created cards will be associated. orderItemGroups (List[Object]) – (required) See OrderItemGroup for format of the objects. This endpoint is for logged-in users. See POST sale/executeSale.json for non-logged-in users. programType (String) – (required) See webSaleProgramType Values for values. shippingOptionCode (String) – (optional) One of the codes returned by the GET sale/saleConfig.json call if required by the program. Executes the sale for a loyalty card. shippingInformation (Object) – (optional) See ShippingAddress for format of the object. orderItems (List[Object]) – (required) See LoyaltyCardItem for format of the objects. Calculates the total price the user will pay if they later execute the sale. The system may calculate per-item discounts and/or per-order discounts and return those in the response to be displayed to the user before executing the sale. This endpoint is typically used for non-logged-in users since some sale programs can be performed without having an account. See POST sale/calculatePriceForAccount.json for logged-in users. cardTemplateCode (Integer) – (optional) Paytronix-assigned card template code identifying the card type of the user. tierCode (Integer) – (optional) Paytronix-assigned tier code identifying the tier grouping of the user. This endpoint is for logged-in users. See POST sale/calculatePrice.json for non-logged-in users. orderNumber (Int) – (required) The order number for this sale. totalPrice (Decimal) – (required) This is the value actually charged to user. saleGroups (List[Object]) – (required) List of item groups sold. See SaleOrderGroup for format of the objects. discount (Object) – (required) See Discount for format of the objects. promotionItems (List[Object]) – (required) List of promotional items granted to the buyer for this sale. See PromotionItem for format of the objects. promotionItemCount (Int) – (required) Number of promotion items granted to the buy for this sale. groupNumber (List[Object]) – (required) Sale order group number matching the groupNumber in one of the orderItemGroups in the request. saleItems (List[Object]) – (required) List of items in this sale group. See SaleOrderItem for format of the objects. itemNumber (Int) – (required) A unique number that identifies the order item within the same group. This is the echo of itemNumber in OrderItem from the request. discount (Object) – (required) See Discount for format of the object. deliveryUrl (String) – (required) The URL through which one can retrieve the detailed information of purchased cards. shippingOption (Object) – (optional) See ShippingOption for format of the object. createdCard (Object) – (required) See CreatedCard for format of the object. printedCardNumber (String) – (required) Printed card number of the newly created card. regCode (String) – (required) Registration code of the newly created card, if applicable. label (String) – (required) The name of the program. itemConfigs (List[Object]) – (required) See ItemConfig for format of the objects. paymentMethodTypes (List[Object]) – (required) See PaymentMethodTypeEntry for format of the objects. shippingOptions (List[Object]) – (required) See ShippingOption for format of the objects. cardTypes (List[Object]) – (required) See CardTypeEntry for format of the objects. itemConfigs (List[Object]) – (required) See LoyaltyCardItemConfig for format of the objects. shippingOptions (List[Object]) – (optional) See ShippingOption for format of the objects. itemType (String) – (required) Paytronix-assigned code. See webSaleItemType Values for values. code (String) – (required) The unique code of the item. label (String) – (required) The name of the item (e.g., “Iced Tea”). plural (String) – (required) The plural name of the item (e.g., “Iced Teas”). description (String) – (required) The long description of the item. thumbnailImageUrl (String) – (required) If available, a URL reference to retrieve the thumbnail image of the item. imageUrl (String) – (required) If available, a URL reference to retrieve the (full size) image of the item. price (Decimal) – (required) The price of the item. customerPriceEnabled (Boolean) – (required) If true, allows end user to specify an arbitrary amount, within priceRangeLow and priceRangeHigh if defined. Supported by EGIFT program type only. priceRangeLow (Decimal) – (required) If the price is not specified, then the item can have a varying price. In this case, this value specifies the minimum value of the price. priceRangeHigh (Decimal) – (required) If the price is not specified, then the item can have a varying price. In this case, this value specifies the maximum value of the price. initialPrice (Decimal) – (required) If the price is not specified, then the item can have a varying price. In this case, this value specifies the initial selection from one of the entries in the priceList list. priceList (List[Decimal]) – (required) If the price is not specified, then the item can have a varying price. In this case, this list specifies the permitted values for the price. styles (List[Object]) – (required) See Style for format of the objects. onCardRewardWalletCode (Integer) – (required) The wallet code of the reward item (only present if itemType = ON_CARD_REWARD). onCardRewardAmount (Decimal) – (required) The amount of the reward specified by the onCardRewardWalletCode above (only present if itemType = ON_CARD_REWARD). onCardRewardGiftable (Boolean) – (required) True if the reward specified by the onCardRewardWalletCode above can be “gifted” to another user (only present if itemType = ON_CARD_REWARD). plural (String) – (optional) The plural name of the item (e.g., “Iced Teas”). thumbnailImageUrl (String) – (optional) If available, a URL reference to retrieve the thumbnail image of the item. favoriteStores (List[Object]) – (optional) A list of favorite store options to present to the user. See FavoriteStore for values. code (String) – (required) The unique code of the store. name (String) – (required) The name of the store. code (String) – (required) The unique code of the style. label (String) – (required) The name of the item (e.g., “Red”). description (String) – (required) The long description of the style. thumbnailImageUrl (String) – (required) If available, a URL reference to retrieve the thumbnail image of the style. imageUrl (String) – (required) If available, a URL reference to retrieve the (full size) image of the style. code (String) – (required) The unique code of the shipping method. label (String) – (required) The name of the shipping method. price (Decimal) – (required) The price of the shipping method. label (String) – (required) The name of the type. externalAccount (Object) – (required) See ExternalAccount for format of the object. (required) One of the codes returned by the GET sale/saleConfig.json. (required) If true, then the shippingContact and shippingAddress are optional and will be defaulted from billingContact and billingAddress. (required) See Contact for format of the object. (required) See Address for format of the object. groupNumber (Int) – (required) The unique number that identify the order item group within the same order. This should be a sequencial number starts with 1.
recipient (Object) – (required) See Contact for format of the object. deliveryDate (Date) – (required) If the shipping date is not now, then this is the date in the future to ship the items. orderItems (List[Object]) – (required) See OrderItem for format of the object. personalizedFrom (String) – (required) Name of gift sender (used with EGIFT program). personalizedTo (String) – (required) Name of gift recipient (used with EGIFT program). personalizedMessage (String) – (required) Personalized message associated with gift (used with EGIFT program). itemNumber (Int) – (required) The unique number that identify the item within the same order. This should be a sequencial number starts with 1.
value (Decimal) – (required) If the price of this item (from the ItemConfig) did not have a predefined value (which means the value was entered or selected from the priceList by the user), then this is the value entered/selected. code (String) – (required) The unique code of the item. If this is missing, then this discount applies to the entire order. amount (Decimal) – (required) The amount deducted from the original price of the item/order. price (Decimal) – (required) The final price of the item/order (after deducting amount). itemCode (String) – (required) The unique code of the item(s) given by the promotion. itemLabel (String) – (required) The label of the item given by the promotion. imageUrl (String) – (required) If available, a URL reference to retrieve the (full size) image of the item(s) given by the promotion. quantity (Decimal) – (required) The quantity of the item(s) given. price (Decimal) – (required) The price of each item given. Typically, promotion items are free so the price will be zero. promotionLabel (String) – (required) The label of the promotion/reason for giving the item(s). description (String) – (required) The description of the promotion/reason for giving the item(s). integration (String) – (required) Paytronix-assigned code. Contact Paytronix to understand what the possible values are. accountCode (String) – (required) The external code of this user. accessToken (String) – (required) Future use. savedCardCode (String) – (required) Only required if paymentMethod is SAVED_CC. This code was returned by the Payment Service endpoint savedCard. cardholderName (String) – (required) Only required if paymentMethod is CC. The name on the credit card. cardNumber (String) – (required) Only required if paymentMethod is CC. The credit card number (no spaces or punctuation). expirationMonth (Integer) – (required) Only required if paymentMethod is CC. The month of the expiration (0 = Jan, ..., 11 = Dec). cardSecurityCode (String) – (required) Only required if paymentMethod is CC. Also known as the CVV, CVV2, CVVC, or CSC code on the back of the credit card. The following are the possible codes and messages that can be returned by the Sale Service. sale_failed.facebook_disabled Facebook delivery is temporarily disabled. Please use email.